No matter where my workshop has been over the years I’ve always needed sawhorses, clamps and supports to help me work alone. It never fails that I feel as though I need two more sets of hands to work effectively in the shop by myself. So when I saw the Jawhorse I was very intrigued and wanted to find out for myself if it was all it’s cracked up to be. The Rockwell Jawhorse is an innovative clamping sawhorse meant to replace several tools in your workshop. The clamping jaw of the Jawhorse allows you to support your work while also clamping it without the need for individual clamps. 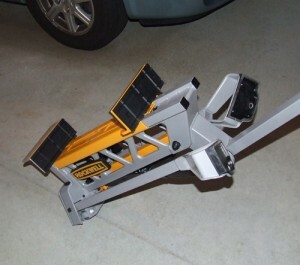 Furthermore, the clamping jaw is activated by a foot pedal so you can place an object on the Jawhorse and clamp it securely without letting go. The Jawhorse actually reminds me of the old B&D work benches that were popular in the 80’s. Those benches required you to turn two screw handles simultaneously to clamp the work piece. However, they certainly were handy and I remember using my dad’s as a kid. The “jaw” clamp boasts an impressive 2,000 lb (1 ton) clamping force that definitely secures almost any project safely in place. The clamping force is so strong that you need to be careful that you don’t damage your work piece by crushing it! The clamp is activated by “pumping” the foot pedal which moves the clamping “jaw” until the work piece is securely clamped. The benefit here is that you can get really great clamping pressure. The downside is it’s a bit hard to control how hard you clamp the work piece by pushing the peddle with your foot. I also found that the Jawhorse wants to slide a bit as you apply pressure to the foot peddle if you’re not paying attention to what you’re doing. The clamps do have a nice hard rubber surface that helps create sufficient friction between the work piece and it also protects it from damage. The clamps also have “notches” in them to help hold irregular shaped objects (like pipes and other round materials) in place without slipping. Once you’re ready to release the clamp you simply slide the clamp locking switch off and press on the foot pedal once until you hear a click. Once you do that the clamp is released and you can slide it away from the work piece. Again, just be careful if you’re working with a piece of finished material because when you apply additional pressure to the peddle to release the clamp it may damage your work piece. 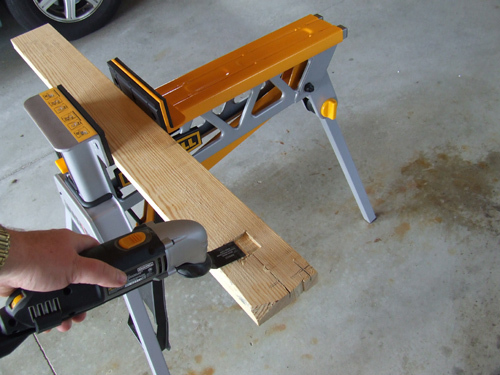 The Jawhorse also works great as a workbench for cutting, sanding or marking material. You can quickly clamp a piece of plywood to the Jawhorse and create a workbench for building assemblies, as a outfeed table for your tablesaw and even a bench to support your miter saw. What I like best is the ability to quickly clamp a piece of wood to the Jawhorse while I cut the wood with a saw similar to the picture where I’m cutting a mortise in a board with the Rockwell Sonicrafter. 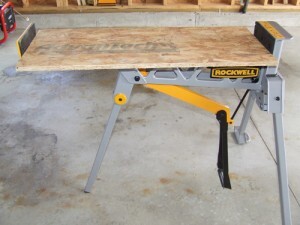 I was really impressed with the overall quality of the Rockwell Jawhorse. The majority of the Jawhorse is constructed with steel and it’s quite sturdy. My only complaint might be that some of the parts (leg locking nut and clamp release switch) are made of plastic. However, having said that all of the pieces seem to be high quality and not cheaply built. I think the Jawhorse is built to last and I don’t see foresee any problems. Assembling the Rockwell Jawhorse was fairly easy. My one complaint would be the directions are fairly useless. However, the Jawhorse is easy enough to figure out and after opening it up and folding it back down was easy to repeat. I like the fact that you can fold up the Jawhorse and store it easily. The Jawhorse also has a nice roller (wheel) on the bottom so you can roll it like I’m showing in the adjacent photo. It would have been nice if they included a handle but the wheel is still a nice feature. Once it’s folded up it doesn’t take up much room so you can store it in a corner of your shop without taking up much room. I’ve also had the pleasure of using the Plywood Jaw as well. 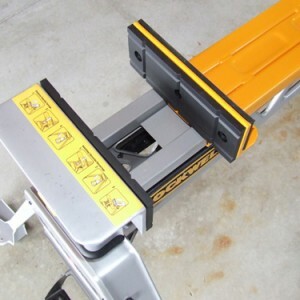 The Plywood Jaw allows you to clamp sheet goods up to 52 inches wide. As you can see in the photo the Plywood Jaw allows you to clamp a piece of plywood on the Jawhorse which becomes very useful. I’m always cutting plywood with a circular saw and trying to clamp it down so it won’t fall or tip as I cut it. With the Jawhorse I can safely cut pieces of plywood with a circular saw now. 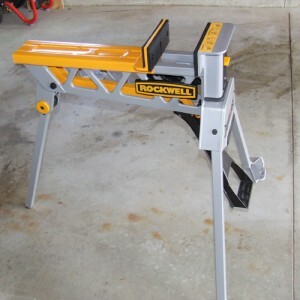 The Rockwell Jawhorse is a really unique new tool that serves the needs of most all projects and workshops. Safely clamping work pieces down when you work is extremely important. I’ve said it many times and I’ll say it again, “You can never have enough clamps”. That’s why I think the Jawhorse is a great product. For under $180 I think it’s a great value and I recommend it to anyone that uses saw horses and clamps! If you’d like to buy the Rockwell Jawhorse then you have some choices. I recommend you check out the Rockwell site or Amazon. Regardless of where you buy the Jawhorse I’m convinced you’ll find it to be a very useful tool around your home or workshop. You can always use a third hand. It looks like this and a couple of quick clamps and it should hold most any work you can come up with.